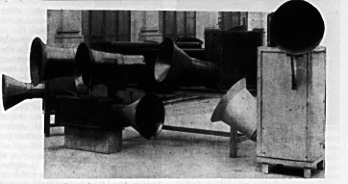 Photo of Russolo, Ugo Piatti and their noise intoners (intonarumori), Milan circa 1920. These were invented in 1914 to correspond with the theories outlined in this essay. There were ultimately 27 different types of intoners, each producing a unique sound in one of the six families listed, including howlers, exploders, crumplers, hissers, scrapers, etc. Russolo performed several concerts with these in the 1920s. Unfortunately, only one very brief recording is known to exist of these (the intoners have apparently been destroyed). Its only about thirty seconds long, so I hope to have it available at this site someday. Another shot of the intonarumori, from 1919.